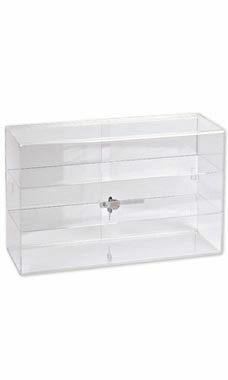 Store Supply Warehouse carries this 2-Shelf Acrylic Countertop Display that can be used for a wide range of display needs ranging from Vapor E-Cigarette displays to cosmetic & jewelry displays. The clear acrylic gives a classy clean look to your retail display that will draw attention to your product and generate sales. Fixed shelf positions. Comes with key & lock. Ships assembled.